Goldman's prediction of Brent-WTI spread collapsing to $5/barrel by the end of this year (see discussion) is clearly not materializing as the differential between the two crude oil indices remains elevated. This premium for Brent is driven by OPEC's tight spare production capacity and Middle East driven supply disruptions risks. 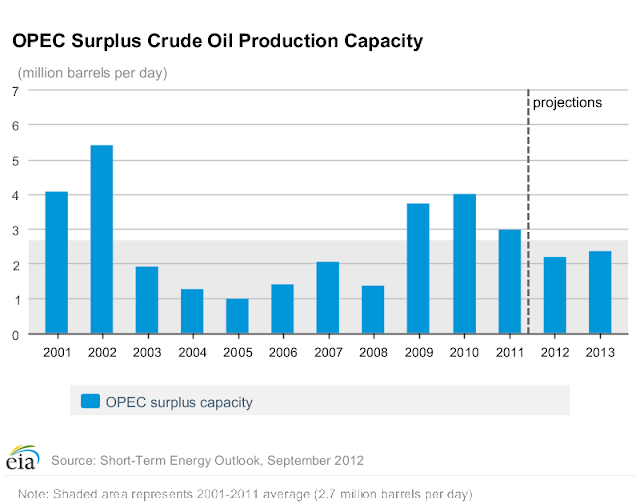 OPEC capacity has been declining and is now mostly comprised of the Saudi Arabia's spare capacity. Moreover there have been questions about the veracity of the Saudi numbers. At the same time some temporary unplanned supply disruptions in the North Sea had pushed the Brent-WTI spread higher. The Saudis have become extremely concerned that high oil prices will trigger demand destruction by snuffing the fragile global economic growth. The latest action by the Fed made them particularly uneasy and they decided this past week to add crude (Brent equivalent) to the market. That sent oil prices lower. FT: - Saudi Arabia has offered its main customers in the US, Europe and Asia extra oil supplies through the end of the year, a sign the world’s largest exporter is worried about the impact of rising prices on the global economy. In spite of the Saudi action to supply the markets with more Brent, the spread to WTI remains relatively wide (even for the longer dated contracts), reflecting risks associated with the latest unrest in the Middle East (see discussion).